One drum could never tell the complete story of a company whose life spanned decades, but the drum featured here could write its own chapter on both what could have been, and what had become of Boston's George B. Stone & Son by the late 1930s. 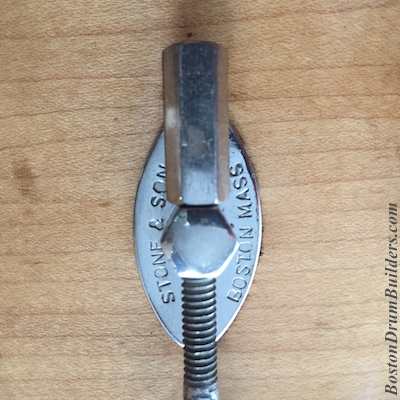 Clearly, the potential existed for Stone & Son to have remained a respected manufacturer of professional level drums. The craftsmanship is proof of this. Yet rather than evolve with the times, George Lawrence Stone had chosen his company's fate. Having never fully modernized its production capabilities or instrument designs, Stone & Son was being left in the dust. Very little had changed about the Geo. B. Stone & Son Master-Model drums since they were first introduced in 1922. Through the 1920s and into the 1930s, the industry had completely passed Stone by. While Leedy, Ludwig, and Slingerland had all moved to double post tube lugs, metal counterhoops, and state of the art snare mechanisms, Stone continued to use an impractical tuning system, wooden counterhoops, and a snare throw-off patented in 1909. What is so stunning about this mid-late 1930s Master-Model aside from the brilliant chrome plated hardware and white marine pearl wrap, is just how well the whole instrument is constructed. There is absolutely nothing shoddy about the execution, nothing lacking in the way of quality workmanship to hint at Stone's long fading prowess as a drum builder. Smaller details about the drum do indicate that the end was near for Stone. The label fixed to the inside of the shell is actually a repair label. Faintly ink-stamped across the top of the label is the word "Manufactured". This is a clear sign that Stone was no longer producing a high volume of drums and that their priorities had shifted towards repair and maintenance of existing instruments. That a repair label rather than a manufacturers label was used on such a high end drum as this one speaks volumes about how late in the life of Geo. B. Stone & Son this drum was produced. Stone did apparently have a few Master-Model badges left sitting around the shop, albeit the silver variety as opposed to the typical bronze badges with a recessed blackened background. The silver version applied here was typically reserved for special drums such as pearl wrapped models and the rare all-metal Master-Models. There are a few interesting differences between this example and earlier Master-Model drums. The most dramatic is the use of ten 'lugs' per side (20 total) as opposed to twelve (24 total). Anything other than a twenty-four lug Master-Model is almost unheard of, the notable exception being the aforementioned all-metal Master-Models which employed metal counterhoops and only eight lugs per side. Another subtle but profound difference here is the use of washers which lack the usual "STONE & SON / BOSTON MASS" stamping. This suggests that Stone's builders had run out of stamped washers and did not expect to churn out enough more Master-Models to warrant having another batch of washers made up with the Stone imprint. 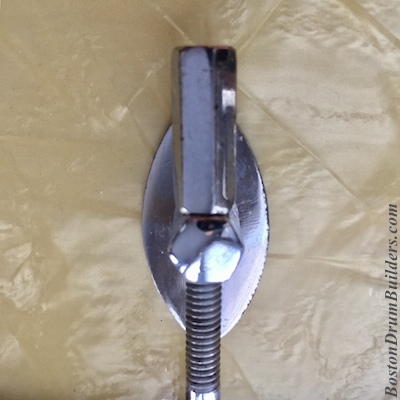 Small signs of Stone keeping up with the times are evident in the use of chrome plating, and with the factory installation of a Leedy tone control. Ludwig and Leedy, both owned by Conn at this time, had begun installing tone controls on snare drums beginning in the early-mid 1930s. It should also be noted that wrapped examples of Stone Master-Model drums are quite scarce. Most Master-Models featured a black lacquer finish. Next most common is a natural maple finish. A "Pyralin Master-Model" was offered as early as 1928, but the number of existing wrapped drums suggests that they were produced only in small numbers, likely on a custom order basis. These were expensive drums after all. A 1932 price list offered the Pyralin Master-Model for $50 which equates to more than $800 today. As is typical for Stone, the four digit serial number is both imprinted inside of the shell and ink-stamped onto the label. 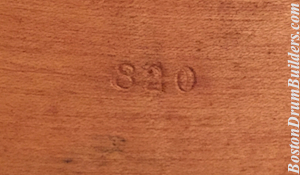 A serial number in the 9600 range places this drum around 1936. A three digit Master-Model number is also stamped inside of the shell in a smaller font. The number, 820, is extremely high, the highest among more than four dozen other recorded examples again confirming just how late this drum was produced. Most earlier Stone drums including Master-Models would have been outfitted with individual strands of snappy wire, wire wound silk, or natural gut. This being a drum from the late 1930s, the James Snappy Wires installed on the drum at present may well be original. 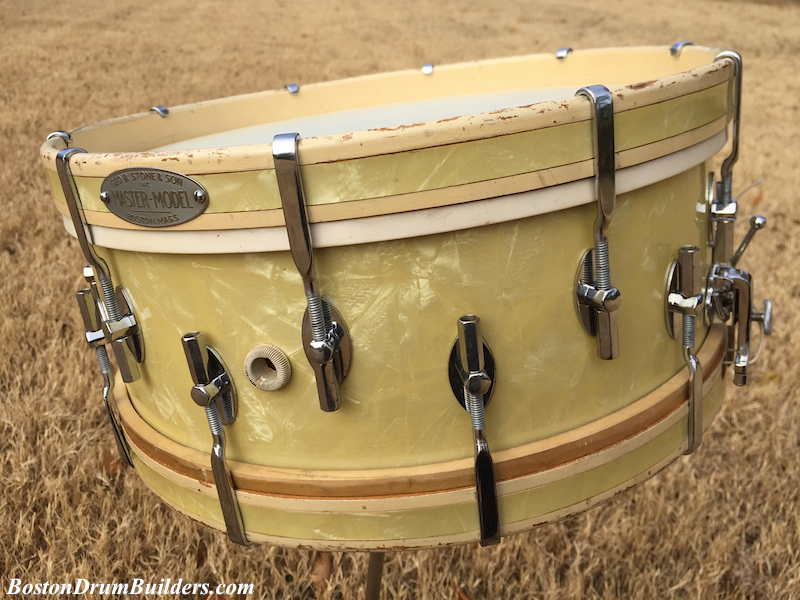 New calfskin heads bring this drum back right back to 1936, just before Stone & Son was done for good. 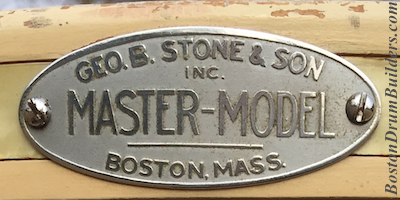 Do you have a Stone Master-Model? I would love to hear about it! Shoot Lee an email at lee@vinson.net. And for more on George B. 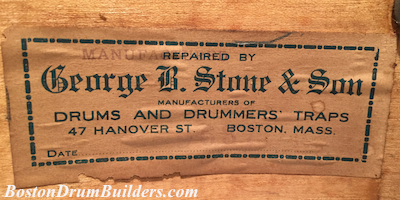 Stone & Son and all of the early 20th century drum makers of Boston, Massachusetts, please visit BostonDrumBuilders.com.